David Dayen's piece in Monday's Intercept, Nancy Pelosi's Drug-Pricing Talks With The Trump Administration Are About Mediating Fights Between Corporate Interests, highlights her balancing the bottom lines for campaign donors at Big PhRMA and the hospital industry and leaving consumers to rot. It would be worse if she was a Republican-- but it would be a lot better if she was still a progressive. She hasn't been-- in over a decade. "The situation," wrote Dayen, "reveals a familiar dynamic in Washington, where political parties don’t debate each other on policy as much as they mediate fights between corporate interests. Almost everything on drug pricing coming out of the Trump administration, whose Health and Human Services Secretary Alex Azar was the president of drug company Eli Lilly, attacks pharmacy benefit managers and hospitals to the benefit of drug companies; almost everything coming out of the speaker’s office attacks drug companies to the benefit of pharmacy benefit managers and hospitals." As Pelosi slips into her dotage and prepares for retirement, maybe she and her pet lobbyists she stop messing with issues like this and leave it to people like Pramila Jayapal and Bernie Sanders, who actually work for the people, not for the special interests. What a novel idea for a congresswoman who's time is up-- her whole team's time is up; they are stale and their expiration dates are long past due. Time to go. Time to say good-bye. Peter Daou had a successful career in the music business before he became a prominent Democratic blogger and then Democratic strategist. I always liked the guy and felt sad when he seemed to buy into the corporate Democratic insanity hook, line and sinker. I didn't understand; I looked away. All that Hillary nonsense-- he was always too smart for that. Yesterday he penned a confessional for The Nation, I Was Bernie’s Biggest Critic in 2016-- I’ve Changed My Mind. Today, he writes, Bernie can beat SeñorTrumpanzee "and it would be an epic act of self-destruction for Democrats to try and hobble his campaign"... which is precisely what some of his old allies are trying to do. "If you had told me in the spring of 2016 that three years later I’d be touting the merits of the Bernie Sanders campaign-- taking flak from Hillary Clinton supporters for not being loyal enough to her-- I would have laughed and asked what alternate reality you lived in. But life and politics have a way of taking unexpected turns, and here I am writing about the considerable strengths Sanders brings to the 2020 election." Bernie Sanders is unquestionably in the top tier of candidates for the Democratic nomination, and it would be an epic act of self-destruction for Democrats to plunge into an internecine conflict over his candidacy at a time when they need to marshal every asset to defeat Trump and his GOP cronies. I am calling on Democrats, progressives, and leftists to hit the pause button, to table our disagreements, no matter how intense, as we fight to preserve the rule of law and the last semblance of our democracy. We owe it to ourselves and our country. ...My political and personal evolution since 2016 has caught some people off guard. I’m often asked how a staunch Hillary Clinton advocate and former Sanders critic could reverse course. The answer is simpler than it appears. I spent fifteen years before the 2016 election as a progressive activist, a critic of the Democratic Party’s meekness in the face of GOP extremism, and a supporter of the policies Bernie Sanders promotes. After months of self-reflection about my own role in the 2016 primary, I realized I was among the far too many Clinton and Sanders supporters who got caught up in an ugly family dispute that spiraled out of control. We’ve all experienced those explosive fights. In the heat of the moment, we see each other as enemies rather than human beings who largely share the same goals. So I began to reach out to repair what had been broken. On Twitter, I unblocked Sanders supporters who I had argued with. I tried to see things from their perspective and I asked them to do the same. There’s still some residual anger and skepticism, but the healing process has given me invaluable perspective, and I can now look at the 2020 primary through a clear lens. ...Virtually every state and national poll shows Sanders at or near the top of the Democratic field. Polls are fluid at this stage, but Sanders is a known quantity and his base of support is solid. His proven appeal to young voters and independents is a powerful asset, and his ability to deliver a well-crafted and unapologetic progressive message to Americans across the political spectrum is crucial if Democrats hope to take on an increasingly extremist GOP. ...Sanders has played a central role in advocating enlightened, compassionate, forward-looking policies like Medicare for all, free public college, a living wage, and more. In the heat of the 2016 primary, I was reluctant to give Sanders credit for moving the national debate to the left. But it is impossible to deny the important role he has played, and continues to play, in countering the far right’s extremist ideas. During the most ferocious debates of the Clinton-Sanders contest, I repeatedly implored Sanders supporters who disliked Clinton to focus on the ultimate prize: defeating the authoritarian right. I argued that her positions were immeasurably superior to Trump’s and that tearing her down was a grave mistake when we faced the prospect of white nationalist rule. The same holds true today for Sanders. Trying to hobble his campaign is a reckless mission. ...Alarmingly, the ferocity of the GOP’s attack on our norms and values is met with timidity from the Democratic Party leadership. Even after grassroots activists and voters generated a 2018 blue wave that swept Democrats back into power in the House, the party leadership has proven incapable (or unwilling) to rise to the historic challenge of facing down encroaching fascism. There are no saviors coming to rescue us. We must become our own leaders. To defeat Trump and to reverse the rising tide of white nationalism that threatens the foundations of our democracy, we must have the courage to set aside old grievances for the greater good. Bernie Sanders is not the only candidate who can defeat Trump, but he’s certainly one of them. And he should not be treated as the enemy. When you woke up yesterday, Democrats were still sweating how to win back the state House of Representatives in 2020. There were 54 Republicans and 46 Democrats in the body so the Dems have to win 5 seats. That changed before everyone went beddie-bye. 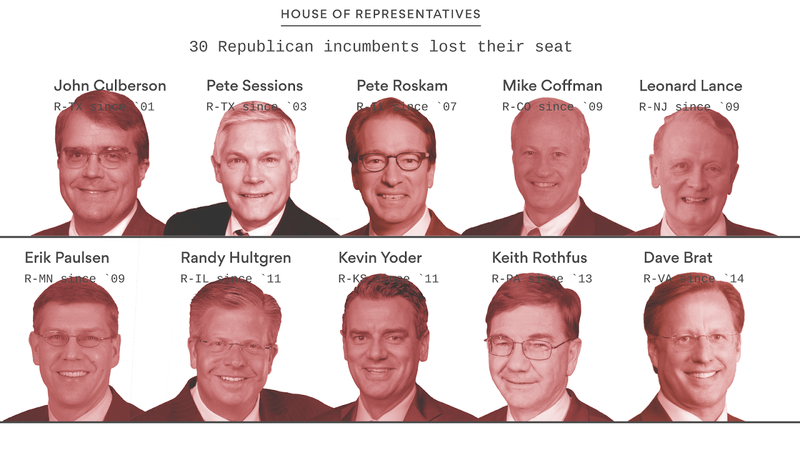 Now there are 53 Republicans and 47 Democrats in the House. One Republican switched parties-- and not just any Republican. Andy McKean is was the longest serving Republican in the state legislature-- 40 years. He re-registered as a Democrat. Why? Señor Trumpanzee, of course. McKean: "With the 2020 presidential election looming on the horizon, I feel, as a Republican, that I need to be able to support the standard bearer of our party. Unfortunately, that's something I'm unable to do... I think the party has veered very sharply to the right. That concerns me." The rural 58th House district is primarily made up of Jackson County, includes most of Jones County, and Cascade and Whitewater townships within Dubuque County. Maquoketa is the closest thing to a city-- population about 6,000. The district falls entirely within the first congressional district, where garden variety Democrat Abby Finkenauer beat GOP extremist Rod Blum last year. The 58th stayed loyal to Blum-- and had gone to Trump in 2016, 57.8% to 37.1%. In 2018, McKean defeated his Democratic opponent, Joe Oclon 9,004 (69.2%) to 4,004 (30.8%). This is a red district and McKean didn't flip blue to gain any partisan advantage for himself. Jeff Kaufmann, chair of the Iowa GOP is already on the attack: "When he was running for office a mere five months ago, he made a commitment to the voters of District 58, running on the Republican platform. Today, he has violated the trust of the voters in his district." The Des Moines Register reported that this could auger poorly for Republican legislative plans. Todd Prichard, the Democratic Minority Leader, said the shift creates an "interesting dynamic" for the rest of the session, which is expected to end within days. It's unclear whether Republican lawmakers have the votes to pass several policy bills. "If the majority wants to bring forward what I would call controversial and bad ideas ... it would probably delay," Prichard said. "We're not going to lay down and just acquiesce to that kind of partisan idea. ... It could definitely prolong the session." McKean, a retired attorney, has been long viewed as a moderate within his party and hasn't always voted along party lines. Earlier this session, he was the only Republican in a committee meeting to vote "no" against a bill that would revamp who is on the commission which selects judge nominations for the Iowa Supreme Court. Many Republican lawmakers argue the legislation would make the nomination process more accountable to voters, but Democrats and lawmakers like McKean have said it will make the courts more partisan. While McKean considers himself a moderate, he said he still is more fiscally conservative. But he said he sees the Democratic caucus as more moderate, and that he will be able to find a role in the party. "There may be some things I might not appreciate in that caucus as well," he said. "I will continue to speak out for what I believe in. I look forward to that opportunity." McKean has been in the Iowa Legislature for decades, though he left for several years. He was first elected to the Iowa House of Representatives in 1978, and also served in the Iowa Senate from 1993 to 2003. He rejoined the House when he was elected to represent Anamosa in 2016. McKean: "I might have limped along attempting to work within my caucus for what I felt was best for the people I represent if it hadn’t been for another factor. I believe that is just a matter of time before our country pays a heavy price for President Trump’s reckless spending and short-signed financial policies, his erratic, destabilizing foreign policy, and his disregard for environmental concerns... Furthermore, [Trump] sets, in my opinion, a poor example for the nation and particularly for our children by personally insulting, often in a crude and juvenile fashion, those who disagree with him, being a bully at a time when we’re attempting to discourage bullying, his frequent disregard for the truth, and his willingness to ridicule or marginalize people for their appearance, ethnicity or disability." A headline by Julie Bykowicz and Ken Thomas in this morning's Wall Street Journal-- Joe Biden’s Expected 2020 Bid Is Likely to Rely on Big Donors-- makes it perfectly clear which lane Biden is going for in the 2020 nomination battle: the status quo, conservative lane financed by the rich, not by the party's grassroots. And Status Quo Joe is aware how creepy and reactionary that looks. The Journal piece reports that "He has expressed concern to Democratic fundraisers that he won’t be able to make a splash with early online donations the way Mr. Sanders and other candidates have." That's because he spent a career spanning decades kissing up to banksters and corporate executives and ignoring the legitimate interests of working families to super-serve the rich and powerful. Last January, Ben White reported for Politico that Wall Street was freaking out. 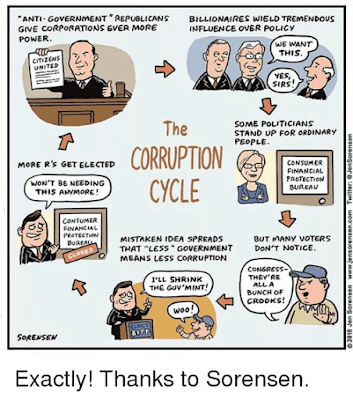 As much as many of the top banksters want to see Trump done, what they don't want is Bernie or Elizabeth Warren-- harbingers of profound and fundamental change-- getting into the White House. They were most excited about Michael Bloomberg but they were open to some others as well: "After mentioning Bloomberg, Wall Street executives who want Trump out list a consistent roster of appealing nominees that includes former Vice President Joe Biden and Sens. Cory Booker of New Jersey, Kirsten Gillibrand of New York and Kamala Harris of California. Others meriting mention: former Virginia Gov. Terry McAuliffe, former Colorado Gov. John Hickenlooper, former Maryland Rep. John Delaney and former Texas Rep. Beto O’Rourke, though fewally know his positions. Bankers’ biggest fear: The nomination goes to an anti-Wall Street crusader like Sen. Elizabeth Warren (D-MA) or Sanders. 'It can’t be Warren and it can’t be Sanders,' said the CEO of another giant bank. 'It has to be someone centrist and someone who can win.'... [O]ne hedge fund manager and top Democratic donor: 'If it’s Biden and Beto or Biden and Harris, that might make a difference. The good news for Biden is everyone likes him. The bad news is there is not a lot of passion.'" Now, 3 months later people are wondering which of the candidates are actual Wall Street whores... and which ones are more likely to protect society from Wall Street banksters? Branko Marcetic, reporting for In These Times, figured out that the worst corporate shills are Cory Booker, Kamala Harris and Kirsten Gillibrand. The 2020 Democratic presidential race has so far featured a common theme: candidates clamoring to demonstrate who will most fearlessly take on corporate America. Across the field, Democrats have staked out progressive-- and at times startlingly new—positions on everything from instituting single-payer healthcare to reviving the Glass-Steagall Act, rejected corporate PAC money and refused to take lobbyist cash, all in a bid to prove their progressive bona fides. “These numbers reveal a campaign powered by the people,” said a member of California Sen. Kamala Harris' campaign about her first 24-hour donation haul. “The system is being rigged by people with money and people with power,” said New Jersey Sen. Cory Booker as he pledged not to “take a dime from corporate PACs.” “I think it's important for people to know my values are never for sale,” said New York Sen. Kirsten Gillibrand. But even as these candidates vocally reject corporate America, their latest fundraising reports show corporate America hasn't rejected them. In These Times examined the April 15 FEC filings of the leading Democratic candidates—Cory Booker, Pete Buttigieg, Kirsten Gillibrand, Kamala Harris, Beto O'Rourke, Bernie Sanders and Elizabeth Warren—and analyzed the donations they received from employees of the six largest U.S. banks (J.P. Morgan Chase, Bank of America, Citigroup, Wells Fargo, Goldman Sachs and Morgan Stanley) and the world's six largest private equity firms (The Carlyle Group, Blackstone, KKR, Apollo Global Management, CVC Capital Partners and Warburg Pincus). While these firms don’t represent the totality of corporate America, their profits ride on the continued growth of corporations, and they remain deeply financially invested in maintaining the status quo in policy areas such as taxes, healthcare, pharmaceuticals and the environment. Wall Street, a fundraising backbone for the Democratic Party, guides many decisions in Washington around these policies. The support a candidate receives from these financial behemoths is instructive in judging how far they would go as president in siding with progressives and bucking moneyed interests. Not to mention that failing to properly regulate and break up the nation's largest banks-- which are now bigger than they were before the 2008 crash and are again engaging in risky lending-- could lead to another devastating crash, as Johns Hopkins University economics professor Lawrence Ball has warned. The findings show that, despite candidates’ stated antipathy toward Wall Street, a number of them are benefitting greatly from executives and employees of these financial firms. By far the candidate most favored by these 12 firms is New Jersey Sen. Cory Booker, who received a total of $88,492 from them over the first quarter. Booker, who jumpstarted and then fuelled his political career with contributions from the finance world, has in recent years attempted to shed his Wall Street-friendly reputation. Booker drew particular scorn during the 2012 presidential campaign, when then-President Obama was leading a populist-tinged assault on opponent Mitt Romney's time as head of private equity firm Bain Capital. ...[I]t's the private equity world that was most generous to Booker, who in the past quarter received a total of $49,500 from four of the world's six largest firms. Booker received $10,200 from Blackstone, a firm awash in controversy for everything from its slumlord practices after snapping up much of the United States' foreclosed housing stock to a plan hatched by one of its executives during the 2016 election to put Americans' retirement savings into hedge funds. Booker received $2,800 from Blackstone’s executive vice chair, Hamilton “Tony” James, who in 2012 echoed Booker's complaints about Obama's criticisms of the private equity industry. Apollo Global Management (AGM) has shown a particular affinity for Booker, with 28 of its employees showering him with a total of $32,100. Donors from AGM included not only investors and portfolio managers, but the firm's chief legal and financial officers, four of its partners and the global head of its “human capital” division. Like many private equity firms, Apollo has been criticized for its use of leveraged buyouts to acquire businesses, often leading to job losses and even bankruptcy, as when cloud computing company Rackspace laid off 275 employees in 2017 mere months after being acquired by Apollo. ...Then there's California Sen. Kamala Harris, who received a total of $44,947 from these 12 firms. Harris, who was once branded a “bankster's worst nightmare,” and has touted her prosecutorial record against banks as evidence of her progressive credibility, received donations from five executives of these firms. They include Blackstone managing director Tia Breakley, Morgan Stanley's new head of international wealth management Colbert Narcisse, Bank of America senior vice president for diversity and inclusion Alex Rhodes, and Goldman Sachs vice president of financial crime compliance Margaret Cullum. 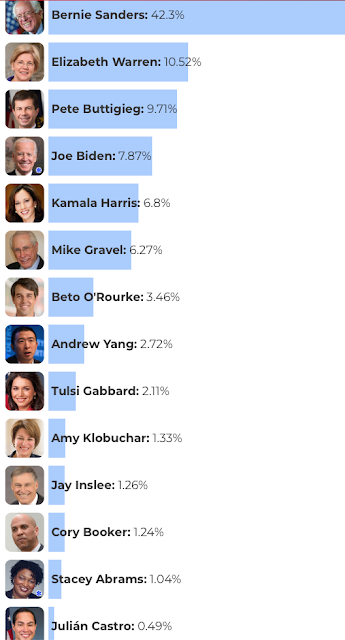 Harris's most enthusiastic source of support among these firms, however, is Wells Fargo, from whose employees she received a total of $16,713-- the most funding from the bank out of any other candidate examined. The donors span multiple tiers of the bank's hierarchy, from bankers and consultants, to a regional director and a manager, to executives like National Head of Cards and Retail Services Beverly Anderson, both of whom gave the maximum individual donation of $2,800 to Harris. Wells Fargo's generosity to Harris raises eyebrows for several reasons. For one, the bank was one of the key players in the 2008 financial crisis, paying billions of dollars worth of fines for its contributions to the crash, and it has continued to earn legal sanction for doing things like opening up accounts without customers' consent and accidentally foreclosing on hundreds of customers between 2010 and 2015. Vermont Sen. Bernie Sanders has called the bank “the poster child for greed, recklessness and illegal behavior,” and Massachusetts Sen. Elizabeth Warren has made it a particular target of her campaign, calling for the firing of its CEO and for colleges to stop letting it market financial services to students. The other cause for concern is Harris's role in the 2012 foreclosure settlement with Bank of America, Wells Fargo, JPMorgan Chase, Citigroup and Ally Bank, a key element of her current campaign pitch. While Harris played hardball to get more money from the firms, reporter David Dayen has called the settlement she helped negotiate “a blight on this country” for its grossly inadequate relief to foreclosed homeowners. Yesterday, Rebecca Kheel reported that most of the Democrats running for the 2020 nomination are advocating putting the U.S. back in the nuclear deal with Iran. Elizabeth Warren: "Our intelligence community told us again and again: The Iran Deal was working to prevent Iran from obtaining a nuclear weapon. If Iran continues to abide by the terms of the deal, you bet I will support returning to it." Instead, Trump is working at provoking Iran and making the situation even worse. 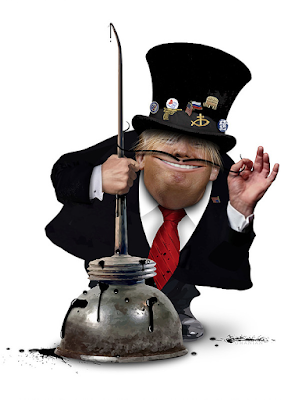 On Monday he announced he will not renew sanctions waivers that allow our eight partners in the deal to continue buying Iranian oil. Netanyahu is strongly opposed to the deal and Trump "has signaled he intends to use his support for Israel as a wedge issue against any Democrat who runs against him next fall. A Bernie aide told the news site Al-Monitor last month that the candidate would "rejoin" the Iran deal "and would also be prepared to talk to Iran on a range of other issues, which is what Trump should’ve done instead of simply walking away." Harris, hoping to have it both ways, told Al-Monitor she supports re-entering the deal "if the U.S. could verify Iran is not cheating." (International inspectors have repeatedly found Iran to be in compliance with the key aspects of the agreement.) McKensey Pete's and Beto's spokespersons said they'd rejoin the deal too, as would Julián Castro, Eric Swalwell, Marianne Williamson, Seth Moulton, Jay Inslee, John Delaney and Tulsi Gabbard. Biden is still focus group-testing the issue to see where he stands. Trump’s decision to withdraw can be framed by Democrats as one of several moves that have alienated allies and "pander to a far-right political base. We just think this is a clear slam-dunk policy position for a Democrat. In May 2018 Morning Consult survey that found 68% of Democrats supported the deal. Experts say bringing the U.S. back into the deal could be done simply and with executive action, and that it would not require votes in Congress. The Democratic National Committee adopted a resolution in February calling on the U.S. to rejoin the agreement. Experts say part of the reason Iran continues to follow the deal is because Tehran hopes Trump is a one-term president and that his successor rejoins the agreement. U.S. allies in Europe strongly opposed Trump’s decision to withdraw, and they have been scrambling to save the pact. As a workaround to Trump's sanctions, the European Union set up mechanism to facilitate trade with Iran. But no transactions have gone through it, leading to mounting frustration from Tehran, said Barbara Slavin, director of the Atlantic Council’s Future of Iran Initiative. “Clearly there are people in the administration and outside … who are trying to make it extremely difficult to return” to the deal, she said. But Iran knows that if it leaves the deal it would be “falling into trap” set by the administration, Slavin said, adding that Trump’s withdrawal and Revolutionary Guard designation could likely be undone with executive action. Yesterday Haaretz was kvetching that Israel is worried that the Democratic presidential candidates are promising to re-engage with Iran. Netanyahu's ambassador to Trump warned Democrats that re-entering the Iran Deal is "unacceptable." What is Israel going to do? Not accept the more than $3 billion in military aid it gets from the U.S. annually? Through itself into the arms of the Cossacks? Pull off another USS Liberty caper in the Mediterranean? Tell Jewish Democrats to vote for and contribute to Señor Trumpanzee? Abut you know what? If Israel is concerned, the Saudis and Emeratis are flipping out completely. How far will they go to defeat Democrats and bolster Trump? Early yesterday, while Trump was tweeting up a storm against his enemies in the media, NBC News was reporting that a network of more than 5,000 pro-Trump Twitter bots railed against what Trump and his allies deceptively call the "Russiagate hoax" right after Barr released a redacted version of Mueller’s report. NBC noted that "The network illustrates the ongoing challenge Twitter faces in persistent efforts to manipulate its platform. These bots, however, did not appear to come from Russia. Instead, the bots had ties to a social media operation that previously pushed messages backing the government of Saudi Arabia and were connected to a person who claimed to be a private social media consultant, according to internet domain and account registration records. The bots, which were created last November and December, were pulled down by Twitter on Sunday night for breaking the social network’s rules against “manipulation,” the company said. As social media platforms continue to prepare for the 2020 election, efforts to spread disinformation and sow discord remain an ongoing issue. And while operations sponsored by foreign countries are still a threat, the rise of for-profit trolling operations, which may include the new bot network, have added a new element for companies to counter. The thousands of accounts are tied together by their frequent interactions-- including likes, retweets and copied tweets-- with a recently rebranded account called @TheGlobus, which posed as a news organization. Thousands of the accounts appeared to exist solely to “like” articles from @TheGlobus on Twitter, many only “liking” tweets from @TheGlobus and no other account. Until its rebrand last month, @TheGlobus went by the username @ArabianVeritas and mostly posted positive news, policy initiatives and memes about Saudi Arabian Crown Prince Mohammed bin Salman. It is unclear whether the accounts had any official connections to the government of Saudi Arabia. Arabian Veritas called itself “an initiative that aims to spread the truth about Saudi Arabia and the Middle East through social media engagement” on its abandoned Instagram account. Despite rebranding as a news organization-- though it shows no evidence of employing journalists and its website is broken-- the account remained a “verified user” on Twitter. The domain name for Arabian Veritas was registered to the name of Salah Faya, who listed himself as an “e-Services and e-Government Expert” and “software solutions consultant” for a ”confidential” firm in Jeddah, Saudi Arabia, on his Facebook page at the time of Arabian Veritas’ creation. 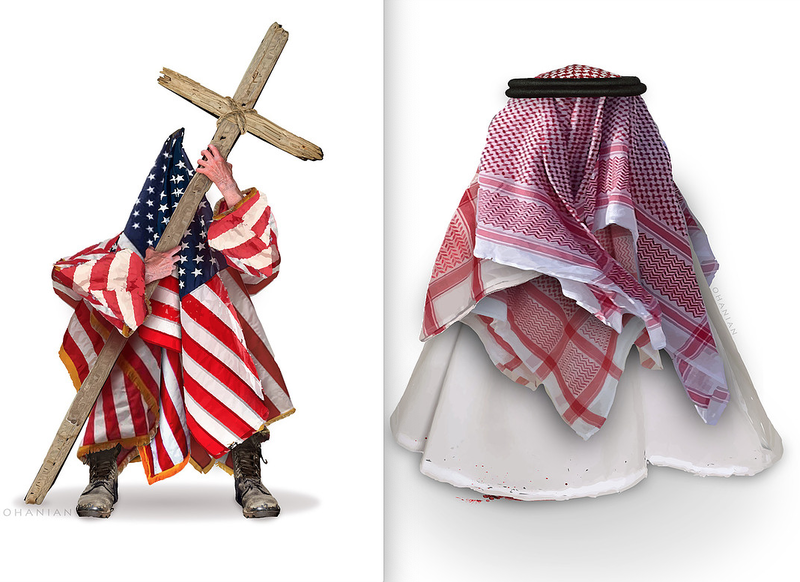 Saudi Arabia and contractors close to it have conducted extensive influence campaigns on Twitter in recent years to push positive news about the government and attack its enemies. One ally and former strategist of bin Salman, Saud al-Qahtani, is known as the “Minister of the Flies” for hiring bot and troll armies that tend to swarm on detractors. It does not appear that al-Qahtani had any connections to the bot network that Twitter removed on Sunday. In October, bots backing the Saudi Arabian government flooded Twitter with messages railing against Jamal Khashoggi, who had been assassinated a few days earlier in Turkey’s Saudi consulate by Saudi government agents. Twitter removed the botnet that same week. Faya did not respond to requests for comment. “The Globus” and “Arabian Veritas” accounts also did not respond when asked for information. Twitter suspended @TheGlobus on Monday night. "We suspended a network of accounts and others associated with it for engaging in platform manipulation-- a violation of the Twitter Rules,” a Twitter spokesperson told NBC News. “While our investigations are ongoing, in cases such as this, attribution is difficult. If we do have reasonable evidence to support state-backed activity, we will disclose the accounts as part of our information operations archive." The accounts did not go to great lengths to hide that they were automated. Most copied their biographies from other Twitter users. Some even used stock photos, replete with stock photo watermarks, as profile pictures. Josh Russell, an independent misinformation researcher who has previously identified large bot networks, first spotted the accounts on Saturday. He called the network “weird,” and added that they sat dormant between their creation and last week. Watts, who is also an NBC News contributor, called this method of propaganda “influence seeding,” and said the quality of the post doesn’t much matter to those who run these kind of botnets for political influence operations. The Republican Party proudly announces a late addition to their Fabulous Spring Line of Fashion! Got some freaky hair or a combover that won't stay in place on a breezy day? Do you go some places where your standard white hood is just isn't politically correct? What could better than this new Trump hat? Every Republican will want one for the upcoming July 4th Mike Pence-Lindsey Graham-Mitch McConnell Full Monty Dance-Off Night! Reserve yours now! A few minutes later, he seemed to have calmed down: "I will be going to Green Bay, Wisconsin, for a really big Rally on Saturday Evening. Big crowd expected, much to talk about. MAKE AMERICA GREAT AGAIN!" OK, fine. 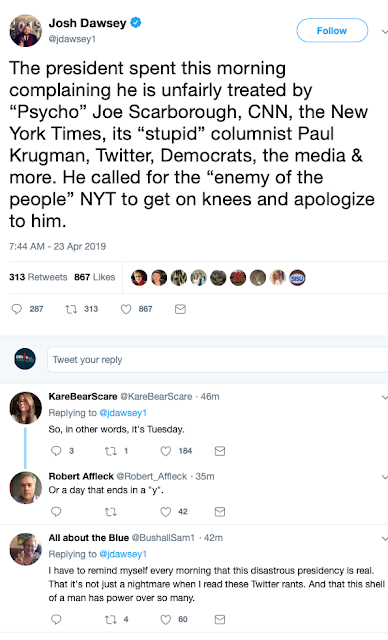 Time to go down to work> Oh, no... something set him off again, almost instantly: "The Radical Left Democrats, together with their leaders in the Fake News Media, have gone totally insane! I guess that means that the Republican agenda is working. Stay tuned for more!" And you didn't have to "stay tuned" for long. A few minutes later he was off-and-running with his grievances: "In the 'old days' if you were President and you had a good economy, you were basically immune from criticism. Remember, 'It’s the economy stupid.' Today I have, as President, perhaps the greatest economy in history... and to the Mainstream Media, it means NOTHING. But it will!" "Sorry to say but @foxandfriends is by far the best of the morning political shows on television. It rightfully has BY FAR the highest ratings, not even close. Morning Psycho (Joe), who helped get me elected in 2016 by having me on (free) all the time, has nosedived, too Angry... ...Dumb and Sick. A really bad show with low ratings-- and will only get worse. CNN has been a proven and long term ratings and beyond disaster. In fact, it rewarded Chris Cuomo with a now unsuccessful prime time slot, despite his massive failure in the morning. Only on CNN!" 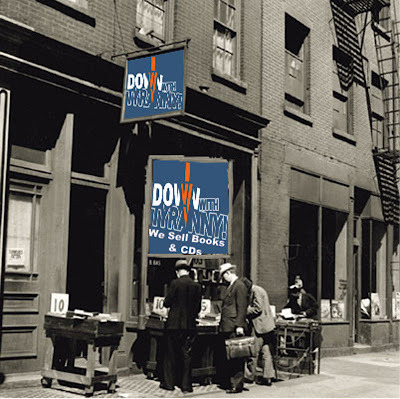 And then it turned 7 AM and he still didn't want to go downstairs and get to work, just watch Maria Bartiromo on Fox Business News: "'Harley Davidson has struggled with Tariffs with the EU, currently paying 31%. They’ve had to move production overseas to try and offset some of that Tariff that they’ve been hit with which will rise to 66% in June of 2021.' @MariaBartiromo So unfair to U.S. We will Reciprocate!" And then he was off on Twitter: "'The best thing ever to happen to Twitter is Donald Trump.' @MariaBartiromo So true, but they don’t treat me well as a Republican. Very discriminatory, hard for people to sign on. Constantly taking people off list. Big complaints from many people. Different names-over 100 M..... .....But should be much higher than that if Twitter wasn’t playing their political games. No wonder Congress wants to get involved-- and they should. Must be more, and fairer, companies to get out the WORD!" 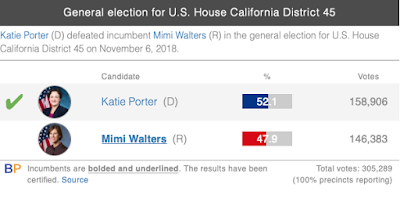 Porter's campaign was largely based on her promise to "to hold Donald Trump and the powerful special interests in Washington accountable on behalf of Orange County families" and her pledge to support Medicare-For-All. She has signed on as an original co-sponsor of Pramila Jayapal's new-and-improved Medicare-For-All Act and her work in the House Financial Services Committee holding the Wall Street special interests' feet to the fire has become her trademark already. Katie was backed by Blue America and we were a little nonplused when her voting record quickly started diverging from progressives. Even now, her ProgressivePunch crucial vote score is nothing to write home about-- a "D," tied with 5 New Dems, like Susie Lee, Chrissy Houlahan and Dean Phillips. An endorsement committee of a board I'm on asked me what was wrong and if we should consider not re-endorsing her. My advise based on two things-- 1- that she is doing incredible work in her committee and 2- that there are still too few votes to make a decision like that, even if we'd rather see her voting with AOC and Mike Levin (in the district next door) than like conservatives like Lee, Houlahan and Phillips. They have nothing going for them-- just the poor voting record-- while she is fulfilling her campaign promise to hold special interests accountable... and in a way few freshman members can match. Blue America is still watching and waiting to see how her first year looks before we re-endorse. But the other board... I voted yes, to endorse again. I suspect Blue America will as well. She may need the help too. There are already 4 Republicans in the primary, Don Sedgwick, a Laguna Hills City Councilman, who has raised big money ($140,977), Ray Gennawey, Mission Viego Mayor Greg Raths and Yorba Linda City Councilwoman Peggy Huang. At one point, Mimi Walters said she would like a rematch and filed paper work with the FEC but she's been quiet and hasn't raised any money so far. Voter registration in CA-45 favors Republicans by about 5 points over Democrats. She has roughed up congressional witnesses in her committee, like billionaire Jamie Dimon, CEO of JPMorganChase and Well Fargo CEO Tim Sloan, as well as the top dogs at Equifax and the Consumer Financial Protection Bureau. She's already considered the best financial affairs interrogator in Congress. But aside from making a name for herself for nailing banksters' and Trump officials' hides to the wall-- watch the 3 videos on this page-- Porter has raised an impressive $416,122.85 for her reelection campaign. When compulsive liar and Trumpist press secretary Sarah Huckabee Sanders asserted last week that congressional Democrats are not "smart enough" to review Trump’s tax returns, Porter went on CNN to respond and offered to "take that bet anytime... I’m trained in tax law. I’m a legal professor. I’m ready to take a look." Huckabee hasn't brought the taxes over for her to look at-- nor, apparently chastened-- has she responded in any other way. After that the big anti-Republican/anti-Trump wave swept some Dems into extremely tough districts with PVIs of R+5, 6 and 7... all considered almost impossible to win. There are two more congressional special elections coming up after the PA-12 seat on May 21... both in North Carolina, the 9th and the 3rd districts. The 9th is doable and the Democrat is has an even chance to win that R+8 seat! The other one, NC-03, that's the R+12 district I was referring to. Almost impossible, but not absolutely impossible. So far the DCCC is pretty much ignoring the district, just as they are PA-12. Walter Jones, a former Democrat and the most independent-minded Republican in Congress, died in February, meaning the seat is open. Obama lost the district both times he ran and Trump crushed Hillary there: 60.5% to 36.9%. Last cycle, the Democrats didn't run a candidate against Jones. There 2016 candidate, Ernest Reeves, took 32.6% of the vote to Jones' 67.4%. Jones never had less than 60% in any of his 11 re-election races. The district includes all or parts of 17 counties from the Virginia border and the Outer Banks to the Marine Corps Camp Lejeune and along the coast past Beaufort, New Bern and Jacksonville and inland to the suburbs around Greenville. The district is mostly rural and the biggest city is Jacksonville, with a population of about 72,000. 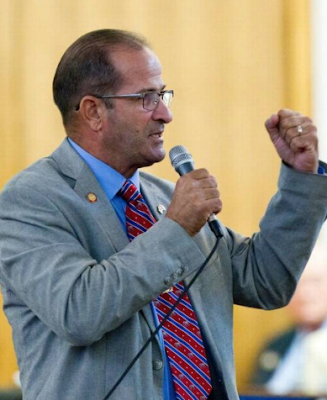 Yesterday a Washington Post OpEd by Max Boot, excoriating the GOP-- My Former Party's Reaction To The Mueller Report Fills Me With Disgust-- isn't likely to make it into the information stream of many-- if any-- voters in NC-03. "Having declared the Republican Party to be morally bankrupt last month-- after 90 percent of GOP lawmakers voted to approve President Trump’s unconstitutional state of emergency-- I am not remotely surprised by the party’s dishonorable and dishonest reaction to special counsel Robert Mueller’s report," he wrote. "But I am nevertheless dismayed and disgusted that a once-great party-- to which I belonged for most of my life-- could become a handmaiden to foreign attacks on the United States and blatant lawbreaking by the president." No one in Currituck, Onslow, Carteret, Terrell, Craven, Pamlico or any of the other are going to see what Boot had to say. I have a feeling not many cable systems in the district carry MSNBC either; just a feeling. • State Rep Phil Shepard, a Baptist pastor. And these are the 6 Democrats participating in their party's primary"
If the world turns upside down, I suppose Bew could beat one of the more extreme Republicans, maybe Rouse or Nix. Thomas and Bew are outraising the other Democrats-- 255,390.10 for Thomas and $124,513.34 for Bew as of the most recent FEC April 10. On the Republican side, Greg Murphy has raised $317,994.00, Joan Perry has raised $154,345.00, Rouse raised $147,640.00, De Luca $119,410.89, Moore $104,781.40, Cairns $75,099.50, while Nix surprised everyone by only bringing in $48,203.50. Chris Hardee, the Democratic Party district chairman says "it's a moderate district where citizens want someone who'll fight for the region's military bases and agricultural economy. The special election raises the wild-card possibility that with the right general-election matchup or narrative a Democrat could pull an upset. This is our best chance-- and maybe our only chance for a while, if we don't win. If they did, it would be historical. How would you like this loud-mouthed piece of crap as a congressman-- let alone a neighbor? • Fred Upton (MI)- won re-election with 50.2%. Trump carried the 6th district by 8.4 points. • Don Bacon (NE)- won re-election with 51.0%. Trump carried the 2nd district by 2.2 points. • Lee Zeldin (NY)- won re-election with 51.5%. Trump carried the 1st district by 12.3 points. • John Katko (NY)- won re-election with 52.6%. Trump lost the 24th district by 3.6 points. • Brian Fitzpatrick (PA)- won re-election with 51.3%. Trump lost the 1st district by 2 points. • Michael McCaul (TX)- won re-election with 51.1%. Trump carried the 10th district by 9.1 points. • Pete Olson (TX)- won re-election with 51.4%. Trump carried the 22nd district by 7.9. • Will Hurd (TX)- won re-election by less than half a point (49.2%). Trump lost the 23rd district by 3.4. • John Carter (TX)- won re-election with 50.6%. Trump carried the 31st district by 12.7. • Jaime Herrera Beutler (WA)- won re-election with 52.7%. Trump carried the 3rd district by 7.4. Last night Dan McCready tried to thread the ol’ anti-Semitism needle, tweeting that he refused racist Ilhan Omar’s donations because he disagrees with any anti-Semitic comments. But then he oddly stood up for the anti-Semite in his very next tweet. Democrats were not happy, as one state Senator slammed McCready’s wish-washy decision to refuse Omar’s money. Looks like McCready can’t have it both ways. On the campaign trail, Joe Cunningham couldn’t stand lobbyists. But now that he’s in the swamp, he’s fallen in love with them. The Charleston Post and Courier reports that Cunningham has hired THREE DC lobbyists to work for him. That "stranglehold" is strong in Joe’s office. The title of the post about "former" life-long Republican Charlie Crist is hilarious, especially since it beckons back to when he was the Republican governor of Florida: Charlie Crist-- The Socialist Democrats' Congressman. See? No matter how right-wing the voting record-- and Crist's is pretty right-wing-- the NRCC has a formula they'll stuff you into anyway: "Socialist! Socialist! Socialist! Venezuela!" When Charlie Crist was Florida’s governor he ran as "The People’s Governor" and now proudly refers to himself as "The People’s Congressman." Through his long political career he’s claimed to put "people over politics," and that being loyal to a political party over the people is wrong. But it looks like Charlie has ditched this conviction quicker than he’s switched political parties by joining the DCCC’s leadership team with the main goal of electing more socialist Democrats to Congress. So much for putting people over politics, right?! Labels: 2020 congressional elections, 2020 presidential election, Charlie Crist, DCCC, DINOs, Joe Cunningham, McCready, NRCC, NRCC Patriot Program, Ohio, Republican wing of the Democratic Party, Socialism!!! Robert Reich released this video above before the new Morning Consult weekly poll came out. But it seems to back up what Reich said. 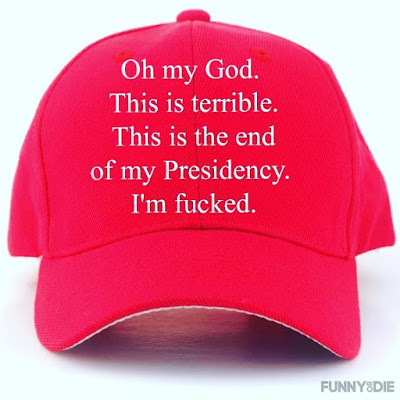 "Trump's net approval sank to its lowest point since Putin handed him the key to the White House following the release of a redacted version of Mueller’s report. While 57% of registered voters disapproved of his job performance, only 39% approved. Worse news for Trump is that among independent voters, 32% approve and 58% disapprove (41% strongly). • Asked if they planning on voting in the Democratic or Republican presidential primaries in 2020, 45% of registered votes said the Democratic primaries and just 34% said the Republican primaries. • Asked who they would vote for if the general election was today, 24% said definitely for Trump, 10% said probably for Trump, 49% said definitely for someone else and 8% said probably for someone else. (among independents, that comes out to 16% definitely for Trump, 10% probably for Trump, 46% definitely for someone else and 11% probably for someone else. • Asked which version of Russian interference they believe, 23% said Trump's version and 46% said Mueller's version. Among independents, only 14% believe Trump's version. You remember Joe Lockhart? He was a Bill Clinton press secretary for a couple of years toward the end of Clinton's term. After that he worked doing communications for Kerry's campaign, Facebook and the NFL, a kind of middle of the road, establishment Democrat. He did an OpEd for the NY Times yesterday, There's A Bigger Prize Than Impeachmentm making the point that "letting Trump stay in office will destroy the Republican Party." He claims that leaving "Trump in office is not only good politics-- it is the best chance for fundamental realignment of American politics in more than a generation" since he's already "three years into destroying what we know as the Republican Party. Another two years just might finish it off. Trumpism has become Republicanism, and that spells electoral doom for the party." Trump has abandoned most of the core principles that have defined Republicans for the past century. Free trade abandoned for protectionism. Challenging our adversaries and promoting democracy replaced by coddling Russia and cozying up to dictators near and far. Fiscal conservatism replaced by reckless spending and exploding deficits. Republicans today are the party of Rush Limbaugh, Sean Hannity and Tucker Carlson-- a coalition that, in the face of every demographic trend in America, will mean the long-term realignment of the federal government behind the Democrats. Lockhart eagerly acknowledges that Trump is unfit for office and that "he represents a clear and present danger to our national security" but judges the whole sordid mess in terms of the Republican impeachment of his old boss. 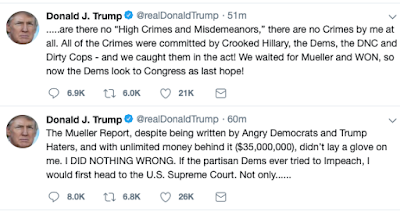 He fears united the GOP around defending Trump; he fears Democratic overreach-- which would be something that hasn't happened in 7 or 8 decades-- and he fears the Senate rejecting impeachment. "And," he wrote, "in politics, a loss is a loss-- there are no moral victories." No salient arguments there. Trumpism equals Republicanism as long as Donald Trump is at the top of the ticket. And a real shift to progressivism in America will be delivered by a devastating rebuke of the president and his party, a rebuke that will return control of the Senate and state houses across the nation. Politics is always a gamble-- and this is the best bet we’ve had in a long time. I would bet that Lockhart defines progressivism as the neo-liberalism of the Clintons, Joe Lieberman and Joe Biden. I would also bet that Lockhart, like other centrist Democrats, would welcome Republicans leaving the GOP into the Democratic Party to the point of allowing them to take over and helping the corporatists shut down actual progressives. We owe American history an impeachment of Trump, not as a moral victory-- and independent of a shameless Republican Senate refusing to convict hi-- but as a gift to posterity. 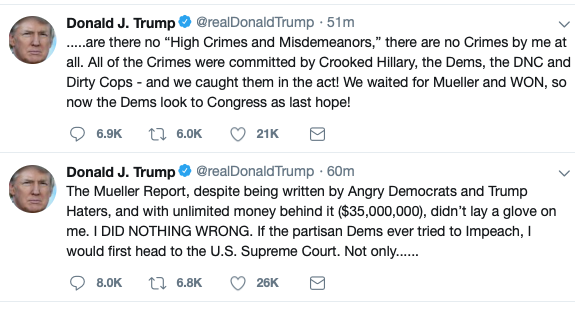 And as an example of calling out a criminal as a criminal, marking him forever, whether he lives in the White House or not. School children in the future should be encouraged to piss on his grave.